Since I spent most of yesterday writing, I decided to focus on another artistic outlet today – jewelry design! I picked out a pendant and spent time choosing the accent beads. I went back and forth between colors until pleased with the final design. Just as I was ready to string it on the wire and attach the clasp, my young niece was ready for special girl time with Aunt Kelly. The almost five-year-old child loves playing dress-up, which includes going through my closet and selecting one of the colorful necklaces in my collection. For Christmas this year, I gave her a selection of strung beads (flowers, hearts, and butterflies) so that she could make jewelry with me. She brought her beads when she came over today, laying them out on the felt mat next to mine. As I strung my design, she created her own from amongst the many vibrant beads in her collection. She made a necklace for herself than wanted to make earrings for the ladies in her household. She didn’t stop at earrings for her baby sister – no, no…her excitement bubbled over when she picked out beads for a bracelet and then a necklace. According to the big sister, even though her two-month-old sis couldn’t wear the creations now, she’d have an entire set “once she’s older”. 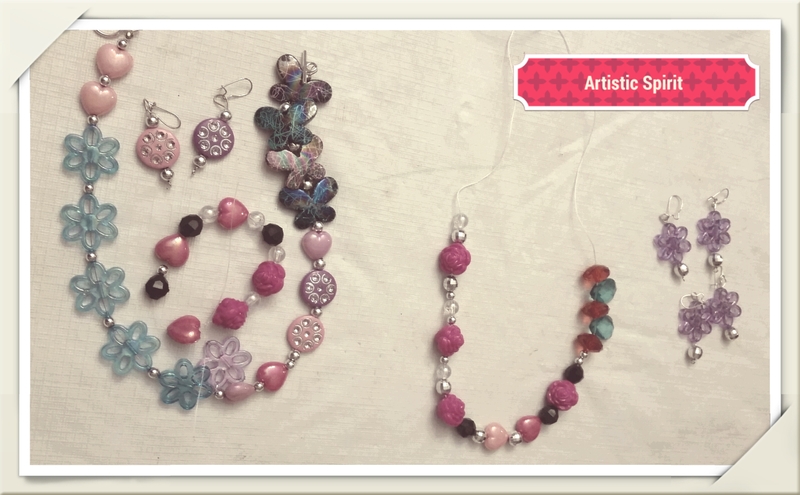 A set for baby sister, one for herself, and earrings for mom. I find great fulfillment in creating jewelry designs for adults, but seeing the joy and creative stimulation in my niece’s face made the art form all the more enjoyable today!